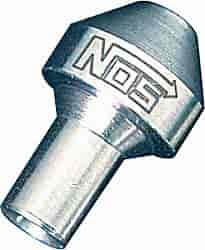 Edelbrock 73035 - Stainless Steel Tapered Nitrous Jet .035"
The importance of properly jetting a nitrous system cannot be stressed enough! Whether adjusting a street kit's power level or fine tuning each cylinder of a direct port fogger system, you need to have the correct jets on hand. Flare jets are the most common jet type in NOS applications. Funnel jets are typically used in 4 and 6 cylinder Sportsman fogger, motorcycle, watercraft, and snowmobile kits.